Presenteeism is a behavior in which an employee is physically present at work with reduced performance due to illness or other reasons. Hospital doctors and nurses are more inclined to exhibit presenteeism than other professional groups, resulting in diminished staff health, reduced team productivity and potentially higher indirect presenteeism-related medical costs than absenteeism. Robust presenteeism intervention programs and productivity costing studies are available in the manufacturing and business sectors but not the healthcare sector. This systematic review aims to 1) identify instruments measuring presenteeism and its exposures and outcomes; 2) appraise the related workplace theoretical frameworks; and 3) evaluate the association between presenteeism, its exposures and outcomes, and the financial costs of presenteeism as well as interventions designed to alleviate presenteeism amongst hospital doctors and nurses. A systematic search was carried out in ten electronic databases from 1998 to 2017 and screened by two reviewers. Quality assessment was carried out using the Critical Appraisal Skills Program (CASP) tool. Publications meeting predefined assessment criteria were selected for data extraction. A total of 275 unique English publications were identified, 38 were selected for quality assessment, and 24 were retained for data extraction. Seventeen publications reported on presenteeism exposures and outcomes, four on financial costing, one on intervention program and two on economic evaluations. Eight (39%) utilized a theoretical framework, where the Job-Demands Resources (JD-R) framework was the most commonly used model. Most assessed work stressors and resources were positively and negatively associated with presenteeism respectively. Contradictory and limited comparability on findings across studies may be attributed to variability of selected scales for measuring both presenteeism and its exposures/outcomes constructs. The heterogeneity of published research and limited quality of measurement tools yielded no conclusive evidence on the association of presenteeism with hypothesized exposures, economic costs, or interventions amongst hospital healthcare workers. This review will aid researchers in developing a standardized multi-dimensional presenteeism exposures and productivity instrument to facilitate future cohort studies in search of potential cost-effective work-place intervention targets to reduce healthcare worker presenteeism and maintain a sustainable workforce. Presenteeism is a contemporary concept which characterizes the behaviour of employees being physically present at work, but with reduced performance . Presenteeism can be categorized into sickness (physical/ mental) and non-sickness presenteeism (due to personal reasons such as work-life conflict, perceived lack of organizational support, stress etc.) . Presenteeism related exposures differ by sector and are common among staff working in jobs with extensive interpersonal interaction . Extended working time due to globalization, downsizing and individual factors such as gaining facetime at work (a strong feature in the Asian environment) due to job insecurity were found to be major contributors to presenteeism behaviour amongst business, manufacturing and public sector employees [4, 5]. Doctors and nurses faced different pressures contributing to presenteeism, such as difficulties finding a substitute due to manpower shortage and strong organizational culture barriers and professional norms against taking sick leave [6, 7]. Robust presenteeism cross-sector correlational studies [8–10], intervention programs and productivity costing studies have been conducted in the manufacturing and business sectors [11–14] but not the healthcare sector. Employees in the health care (nurses and doctors) and education (full-time school teachers) sectors as compared to 42 occupations across six industries were more prone to presenteeism . In the UK 86% of general practitioners reported presenteeism, followed by > 50% hospital doctors compared to only 32% of office workers . Presenteeism outcomes commonly investigated include frequency of sickness presenteeism [10, 15], presenteeism-related productivity and labor costs , and employee health and related medical costs [12, 17]. Presenteeism not only impairs health but also affects team productivity resulting in significant financial costs. The indirect labour costs and medical expenses associated with presenteeism have been estimated to potentially exceed those of absenteeism . As hospital managers seek ways to reduce labor costs which account for more than half of health care institutional expenses while maintaining quality care standards , presenteeism productivity costing and intervention studies may provide useful insights regarding targeted interventions or effective methods to improve work performance. Review findings will aid the development of a comprehensive scale to identify modifiable intervention targets in reducing nurse presenteeism, useful for hospital managers in formulating evidence-based human resources policies. Ten electronic databases (Academic Search Premiere, Proquest (British Nursing Index, Medline, PsychINFO), EBSCO (CINAHL,) OVID (Embase (Classic and Global Health)), Pubmed, SCOPUS, and Web of Science) were searched for English peer reviewed publications from 1998 to 2017. For the purpose of this review, the literature search was limited to publications published after 1998, when Simpson defined contemporary presenteeism as “going to work when unfit” [20, 21]. The inclusion and exclusion criteria are described in Table 1. Search terms were selected from the National Library of Medicine’s controlled vocabulary thesaurus – Medical subject headings (MeSH). All ending variations of selected MeSH terms were included by placing the wildcard symbol (*) at the end of the word root. Search terms within themes were incorporated together using the “OR” Boolean operator, while the “AND” Boolean operator was used to combine themes (see Additional file 1). The systematic literature review was conducted following the PRISMA guidelines. Full time frontline healthcare workers (doctors and nurses). Publication titles and abstracts were screened and for abstracts that failed to provide satisfactory support for the inclusion/exclusion criteria, the full text was reviewed. Two reviewers independently assessed the quality and accuracy of the selected publications and one reviewer screened the publications and tabulated the relevant information. Any discrepancies between the two reviewers were resolved through discussion until consensus was reached. Reference lists of selected publications and those published ahead of print were also manually screened. The Critical Appraisal Skills Program (CASP) tool was adopted to assess the quality of selected publications. The CASP tool includes unique checklists for evaluating eight different types of studies. In this systematic review, the CASP cohort study checklist (modified for both cohort and cross-sectional studies) and the economic evaluation checklist were adopted . The two checklists each contain 12 dichotomous response questions and two questions summarizing study results. Items 6a and 6b of the cohort study tool (length and completeness of follow up) were excluded when assessing cross-sectional studies for a possible total score of 12 for cohort and economic studies and 10 for cross sectional studies. Studies that scored six or above for prospective/ cohort studies and five or above for economic evaluation studies were selected for data extraction. Data extraction by study type tabulated presenteeism related 1) exposures and outcomes, 2) financial costs, and 3) intervention outcomes. Extracted elements included the following:- a) author, publication year and country, b) sample characteristics (population and response rate), c) survey method, d) type of presenteeism studied (sickness, non-sickness, overall), recall period and measuring, e) financial costing method or intervention (for financial costing or intervention studies only), f) measurement instruments and their validity, and g) results of the study. Quality of presenteeism exposures and outcomes measures in assessed studies were evaluated based on its scale selection and reliability, scales with satisfactory Cronbach’s alpha values > 0.7 will be considered for multidimensional scale development in our next stage. Categorization of presenteeism and its exposures and outcomes were primarily based on the most commonly used framework in our assessed studies, the JD-R model. Work-related factors were categorized into four domains: work stressors (job aspects that require substantive mental and physical effort), work resources (job aspects that stimulate personal development, help achieve work goals), work psychosocial emotions (employee emotional and mental outcomes from work) and work outcomes (work performance indicators). Individual factors were categorized into three domains: demographics, individual health (mental, psychological and physical health) and personal factors (factors outside of work). In the initial search, 788 peer-reviewed publications were identified. After removing duplicates, 275 unique publications remained. One hundred and ninety-two publications were screened out based on title and /or abstract leaving 83 publications for full text screening. Of these, 32 were selected for inclusion. 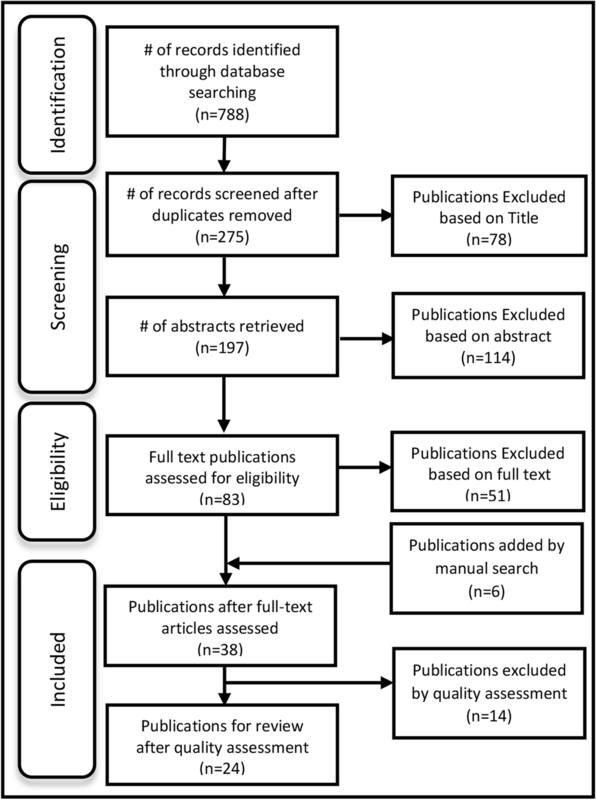 Six additional publications were identified by manual search for a total of 38 publications for quality assessment (see Fig. 1). Of the 38 publications, 61% (N = 22/36) passed the CASP-cohort quality assessment tool, and 100% (N = 2/2) passed the CASP-economic evaluation tool, leaving 24 publications for final inclusion in the systematic review (see Additional file 2). Presenteeism exposures and outcomes were reported in 17 publications, in which three (18%) used a prospective study design [23–25], and 14 (82%) a cross sectional study design [4, 7, 26–36]. All four presenteeism financial costing publications used a cross-sectional study design [18, 37–39]. Of the three randomized controlled trials on the effectiveness of presenteeism intervention programs , two were economic evaluations [41, 42]. Twenty (83%) of the publications included in the systematic review were published after 2010. Twenty-two (92%) drew from Western populations (Europe [4, 23, 24, 27, 28, 30–33, 36, 38–42], North America [18, 25, 26, 29, 37], United Kingdom ) and only two (8%) from non-western locales (South America  and China ). Ten (42%) sampled only nurses [18, 23, 25, 27–29, 34, 41, 42], four (17%) only doctors [4, 30–32] and ten (42%) a variety of health care professionals [7, 24, 26, 33, 35–40]. Nine (38%) used a paper-based survey with response rates of 47–86% [4, 7, 18, 23–26, 29, 39], four (17%) used a web-based survey with response rates of 26–86% [30, 33, 36, 37], two (8%) used a mixture of web and paper survey with response rates approximating 53% [31, 32], and the remaining did not specify the survey method but reported response rates of 49–91% [27, 28, 35, 38, 40–42]. While all exposure and financial costing studies had clearly stated aims, only 16 (73%) adopted an appropriate sampling framework, recruitment strategy or response rate (anonymized, randomized, and > 50% response rate) (Additional file 2). Sixteen (73%) measured presenteeism exposures and 13 (59%) measured outcomes using valid and reliable tools. Ninenteen (86%) considered confounding factors. Of the prospective studies, only two followed up with subjects appropriately [24, 25]. Data extraction on study characteristics and results of selected publications are listed in Additional file 3. Quality assessment on presenteeism organizational and individual exposures and outcomes measures are presented in Tables 2 and 3. Presenteeism exposures and outcomes were measured either by adopting validated scales or self-derived items across assessed studies. Most work-related adopted scales reported satisfactory reliability with Cronbach’s alpha > 0.7. Many of the adopted presenteeism exposures and outcomes scales were culturally-specific and focused on a Western work environment, for example the Dutch musculoskeletal questionnaire, Nordic questionnaire of musculoskeletal symptoms, and general Nordic questionnaire for psychological and social factors at work. Commonly studied exposures/ outcomes included musculoskeletal pain/disease [18, 24, 25, 27, 37], burnout [23, 24, 28, 32, 36], psychological stress [7, 24, 34, 35], age [4, 27–29, 31, 32, 38], gender [23, 27, 30–32, 38], mental symptoms/ conditions [18, 27, 37] and general health [23, 24, 27, 38]. Despite the common exposures and outcomes investigated, scales adopted across studies vary. Four publications reported a dichotomous measure of presenteeism experience (yes/no) [4, 7, 25, 26], seven measured presenteeism frequency on a three to seven-point Likert scale [23, 24, 30–33, 36] and 12 measured presenteeism-related productivity/ work lost using validated Likert-scale composite scores, or hours or days of work lost [18, 27, 29, 34, 35, 37–42] (Table 4). Validated composite Likert-scales measuring presenteeism-related productivity include the Work Productivity and Activity Impairment (WPAI) scale, Stanford Presenteeism Scale (SPS-6) and Work Limitations Questionnaire (WLQ), Perceived Ability to Work Scale (PAWs) and the World Health Organization Health and Performance Questionnaire (HPQ). While the presenteeism recall periods varied from 7 days to 1 year, publications reporting productivity loss/costs had shorter recall periods (7 days-1 month) [18, 27, 29, 34, 37–40], publications reporting on presenteeism experience or frequency had longer periods (6 months-1 year) [4, 23–26, 28, 30, 33, 36, 41], and five did not specify a recall period [7, 31, 32, 35, 41]. Eight (33%) utilized a theoretical framework to guide the study analysis, whereas five (21%) used an individual (Sickness Flexibility Model, Health-driven Economic Burden Model, Role-stress Theory, Effort-recovery Model, Theory of Stress and Coping and Challenge Stressor-Hindrance Stressor Framework) based framework [24, 33–35, 37] and three (13%) used a framework that combined organizational and individual factors (Job Demands-Resources (J-DR) model, Dynamic Model of Presenteeism and Absenteeism, Demands Control model and Effort-reward Imbalance model) [23, 27, 36] (see Table 5). The most commonly used framework was the J-DR framework model [23, 36]. The association between presenteeism and its related exposures and outcomes in assessed studies were primarily categorized on the most commonly used framework JD-R model in Tables 6 and 7. Presenteeism was positively associated with most work stressors [18, 23, 24, 27, 28, 31, 37], but not extensive stooping and working process quality . All tested work resources were negatively associated with presenteeism [24, 26, 27, 31, 32, 35], except for the contradictory findings between presenteeism and supervisory support [28, 32]. Work psychosocial factors such as job satisfaction and other positive work emotions were negatively associated with presenteeism [24, 39]. d’Errico, Demerouti and Vandenbroeck presented contrasting evidence on the relationship between exhaustion and burnout and presenteeism [23, 28, 36]. Others found the depersonalization subdomain of burnout was not significantly associated with presenteeism [28, 36]. Contradictory results were noted in the associations between age [4, 27–29, 31, 32, 38], profession (i.e., nurse) [28, 37, 38], seniority/ work experience [27, 28] and presenteeism. Presenteeism was found to be positively associated with working in the public sector , academia , non-managerial grades , having a paid leave policy , number of days of sick leave  and hours worked . However, presenteeism had no significant association with the workplace setting , marital status , ethnicity , shift-work schedule , permanent employment contracts  or full-time employment . Employee health problems were studied in relation to presenteeism as both exposures and outcomes. Presenteeism was positively related to most employee health exposures such as acute/chronic diseases, overall health symptoms and poor general health [23, 27, 37–39]. Discrepancies exist in the findings on associations between lower back pain interference with daily activities [28, 43], mental symptoms/ conditions (depression/anxiety) and presenteeism [18, 27, 28, 37]. All health outcomes were positively associated with presenteeism, such as decreased physical activities, sleep problems, poor work ability and decreased performance . As for non-health related personal exposures, most studies investigated work-family conflict with all but one study finding a positive association with presenteeism [24, 28, 30, 33]. The Human Capital Costing Method (HCM) was used in all financial costing and economic evaluation studies [37, 38, 41, 42] except for one which used a contingent valuation method . Sickness presenteeism productivity costs ranged from USD $2000 – $15,541 per healthcare employee annually [18, 37–39]. Sickness presenteeism costs (USD $340 /person) were lower than sickness absenteeism costs (USD $463 /person) . All financial costing methods considered overall sickness presenteeism productivity costs. Productivity costs in Letvak’s study were for nurses only, while other publications considered productivity costing for a mixture of occupations (e.g. doctors, pharmacists, dentists, administrators etc.). A randomized controlled trial (diet, physical activity, and cognitive behavioural training intervention) had limited short term effect in reducing mental health related presenteeism whereas an occupational physician follow-up intervention in two different hospitals was found to be cost effective in reducing mental health related presenteeism in two economic evaluation studies [41, 42]. An e-mental health program was not found to be cost-effective (ICER: − 0.047) compared to the occupational physician intervention (ICER: 0.033) . This systematic review is the first to extensively examine multi-dimensional presenteeism organizational exposures measures, productivity financial costing, intervention studies and related psychosocial frameworks within the hospital-based healthcare workforce context. Most of the reviewed publications were cross-sectional in nature and few reported financial costing, economic evaluation or interventions. The contradictory associations found between presenteeism and common exposures or outcomes across studies limit decisive conclusions for the health care field. Although the concept of “presenteeism” first appeared in late twentieth century , there is no agreement on its precise operational definition. While self-derived single-item measures may be suitable for numerical or categorical answers (e.g. number of medication errors, patient falls, demographics), though often criticized when measuring complex psychometric constructs (e.g. social support, mental conditions) due to low content validity (difficulty in representing a complex theoretical concept), limited sensitivity (more items provide more interval points on scale for discrimination) and restricted reliability evaluation (at least a two-item scale needed in evaluating consistency) . Cross-cultural adaptation studies may also be needed before applying scales developed for a specific population to a different cultural context. Moreover, some commonly investigated exposures/ outcomes (e.g. burnout, psychological stress and general health) were measured by varying adopted scales across studies limiting comparability, as constructs may be conceptualized differently across scales. For example, different conceptualized burnout measures were compared amongst nurses and a two-factor structure (exhaustion and withdrawal) was confirmed to be most favourable. Development of a standardized multi-dimensional presenteeism exposures and outcomes scale may alleviate limitations on comparability for commonly investigated factors of interest. Adopted scales with satisfactory reliability (Cronbach’s alpha > 0.7) in the assessed studies will be considered for our scale development in the next stage. Most commonly researched exposures and outcomes focus on medical factors, such as stress, burnout, general health, psychological symptoms and conditions, mostly due to the abundance of occupational health studies. The evidence presented here focuses on the impact of work demands and negative work psychosocial emotions (e.g. burnout, stress and dissatisfaction) as compared to work resources and positive work psychosocial emotions (e.g. satisfaction, positive work feelings, meaningfulness). Existing research on presenteeism exposures amongst nurses focuses on the effect of job design on psychosocial emotions and work productivity. The relationship between organizational policies, leadership style and organizational culture on presenteeism have been widely researched in other sectors but not among doctors and nurses . For a more multi-dimensional and comprehensive overview on presenteeism exposures and productivity effects amongst nurses, future research should expand on these potentially impactful but rarely researched exposures. In this review, presenteeism is measured either by experience, frequency and/or productivity. Operationally some researchers adopted a dichotomized response set to ask whether participants ever experienced presenteeism (yes or no) [21–23] and thereby limited the utility of the presenteeism data [4, 7, 25, 26]. The Likert scales adopted by others [30–32] with inherent numerical assumptions limit outcome comparability. Others have used self-reported workplace presenteeism productivity measurement instruments with variable outcome metrics and others still have used presenteeism productivity outcomes which focus on specific disease states rather than overall health-related productivity [44, 46]. Additionally, in most cases a more nuanced analysis of the impact of seasonality, work related factors and stressors was limited. There is wide variation in presenteeism recall periods amongst selected studies. In a multi-sector productivity audit in the United States, Stewart studied variation in presenteeism recall periods of one, two, and four weeks . The most accurate recall period for health-problem related presenteeism is 2 weeks. Elsewhere researchers used longer recall periods to capture frequency and experience of presenteeism episodes . Variation in recall periods leads to questions about the accuracy of self-reported presenteeism, which has not been considered in most of the studies in this review, a problem which has been highlighted in other reviews [47–50]. With few objective presenteeism and presenteeism productivity loss measures, the accuracy of self-reported presenteeism and absenteeism is difficult to establish. There are however, well established methods for verifying self-report scale precision, such as using retrospective diary data [51, 52]. Progress on the standardization and validation of presenteeism metrics and its monetary conversion methods has been stagnant since Schultz’s systematic review on employee health and presenteeism . Contradictory and limited comparability on findings across studies may be attributed to variability of selected scales for measuring both presenteeism and its exposures/outcomes constructs. Financial costing and economic evaluations valued productivity using the HCM in all but one of the selected publications. HCM often provides the most conservative and highest estimates compared to other costing methods, such as contingent valuation method (CVM) and friction cost method (FCM). HCM is a better estimation method in cost of illness studies, as it avoids self-selection bias possible with CVM when participants respond to hypothetical willingness-to-pay scenario questions, and is comparatively easier for researchers to implement . There is a paucity of intervention and economic evaluation studies amongst hospital doctors and nurses. The research here focuses on mental health improvements whereas others have investigated the effectiveness of workplace health intervention delivery methods across occupational sectors  or specific interventions such as back pain improvement, lighting changes, extra rest break time, telephone support and occupational health . The lack of standardized multi-dimensional presenteeism exposures and productivity measures based on sound theoretical frameworks contributes to the scarcity of intervention and economic evaluation research amongst healthcare workers. While much of the included research was not guided by a theoretical framework, some used psychosocial frameworks at both the individual and organizational levels. These considered the interaction between organizational work factors and individual psychosocial emotions. Individual psychosocial frameworks are more appropriate for occupational health related research that aims to improve employee health from an individual perspective. Existing work psychosocial frameworks include 1) JD-R model, 2) job-demands control (JD-C) model and 3) effort reward imbalance (ERI) model. JD-C model hypothesizes that job stress level depends on the interaction between job demands and individual decision latitude on job control. ERI model hypothesizes that stress arises when received rewards at work are not in line with the perceived effort put in by employees. Both the JD-C and ERI model constrain organizational research to a limited number of negative exposures . The JD-R model considers the dual effect of work resources (positive) and work demands (negative) on work psychosocial emotions . Presenteeism research to date has been limited by theocratical frameworks mostly focusing on medical or individual health related research. However, organizational exposures (e.g. leadership style and organizational culture) were shown to impact presenteeism behaviour and work performance [57, 58]. The authors of JD-R model have recently proposed an updated model to consider multi-level (organizational, team) effects on individual employee presenteeism . This could greatly assist hospital managers in formulating evidence-based human resources policies in the future. The included studies were predominantly conducted in Western jurisdictions. However, for the one study conducted in Asia, stress levels and presenteeism behaviour were significantly higher amongst Chinese employees as compared to their British counterparts . These cross-cultural differences may be explained by the underlying Chinese traditional values of Confucianism and collectivism which emphasize endurance and hardwork . Methodological limitations in our study include but are not limited to the following. Firstly, meta-analysis was not undertaken for the selected publications due to the heterogeneity of presenteeism outcome measures and limited number of studies. Secondly, limiting searches to only English language publications may have restricted the inclusion of publications written in Asian languages such as Korean, Japanese and Chinese. Thirdly, with the potential measurement error and conceptual differences between presenteeism instruments, comparison of presenteeism association with related exposures and economic costs between studies must be interpreted with caution. Lastly, limited cohort, intervention and economic valuation publications were available, confining the generalizability and heterogeneity of results. In this systematic review, no conclusive evidence can be drawn on the association between presenteeism and its exposures amongst hospital healthcare workers based on the heterogeneity and limited quality of measurement tools. More evidence is needed to confirm the relationship between presenteeism positive exposures and outcomes (e.g. job satisfaction, social and supervisory support) amongst healthcare employees, and their feasibility as intervention targets. Based on our findings, researchers should consider theoretical frameworks with multi-level interaction which would allow for vertical and horizontal comparisons within and between organizations (e.g. leadership style and organizational culture) and individual exposures or outcomes in the future . The limited number of economic evaluation studies with non-standardized instruments and varying costing methods restrict the estimation and comparison of presenteeism productivity costs amongst healthcare workers across studies. A standardized multi-dimensional presenteeism exposures and productivity instrument should be developed to facilitate cohort studies from both East and West in search of potential cost-effective and cultural-specific work-place intervention targets to reduce healthcare worker presenteeism and maintain a sustainable workforce. Data supporting study findings are available upon request. JL carried out study screening, quality assessment, data extraction and prepared the manuscript. JJ supervised the study and carried out quality assessment as second reviewer. JJ and EA provided critical comments and finalized the manuscript. All authors read and approved the final manuscript. Thun S, Fridner A, Minucci D, Løvseth LT. Sickness present with signs of burnout: the relationship between burnout and sickness presenteeism among university hospital physicians in four European countries. Scandinavian Psychologist. 2014;1(5). http://psykologisk.no/sp/2014/11/e5/.